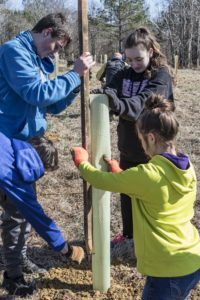 STEM – Students from Falls Lake Academy in Butner and Boy Scouts from Creedmoor joined forces with Tar River Land Conservancy staff and volunteers to plant over 350 trees at the Ledge Creek Forest Conservation Area in early February 2018. The Ledge Creek Forest Conservation Area is a 381-acre preserve near Stem owned by Tar River Land Conservancy. The trees were planted as the first step of restoring an acre of abandoned pasture to woodland. On Friday, February 2, sixty-three 9th graders from Falls Lake Academy braved wind and chilly temperatures to plant 170 hardwood trees. The students were led by Logan Allen, the 9th-grade Earth & Environmental Science teacher at Falls Lake Academy. In addition to planting trees, students participated in an educational hike along Ledge Creek led by David Thomas, TRLC’s Land Stewardship Specialist. Lunch was generously provided for the group by Alec Kearns of Canfor Lumber. On Saturday, February 3, fifteen members of Boy Scouts of America Troop 401 and the BSA Venture Crew led the way to plant an additional 170 trees. The Scouts were joined by family members, TRLC staff, and volunteers Susan Cope, Jim Ellis, Scott Hey, Kenneth and Holli McLamb, Dave Pavlus, Sam Upchurch, and Jeff Zimmer. NC Forest Service County Ranger Rob Montague prepared a reforestation plan that guided the tree planting project, which included several tree species that will eventually provide a variety of food and cover for wildlife. 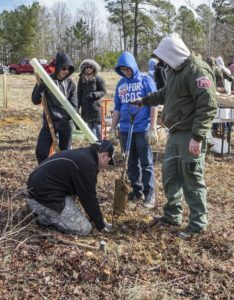 Mr. Montague, Jennifer Roach, and Brian Michaelsen of the NC Forest Service were also on hand to demonstrate proper tree planting methods and provide feedback during the tree planting. Species of trees planted during the event included white oak, willow oak, Southern crabapple, persimmon, blackgum, Chickasaw plum, and American holly. 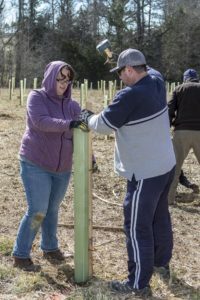 Volunteers installed biodegradable tree shelters to protect each seedling from damage by whitetail deer until the saplings are fully established. Once mature, these trees will provide food for large and small wildlife and nectar for native pollinator insects. The tree planting area adjoins two acres of fields that TRLC will convert to wildflower meadow to attract butterflies and bees. Funding for seedlings, materials, and site preparation activities was provided by the USDA Natural Resources Conservation Service’s Environmental Quality Incentives Program, the City of Raleigh’s Watershed Protection Program, and an Environmental Enhancement Grant from the NC Department of Justice. Three miles of hiking trails are currently open to the public on the Ledge Creek Forest Conservation Area from the trailhead located south of Stem at 3189 Brogden Road. TRLC expects to open a second trailhead located west of Stem along Old NC-75 in early 2019. The second trailhead will eventually provide public access to 2½ miles of new trails being constructed by community volunteers. To see photos of the February 2018 tree planting event taken by photographer Sam Upchurch, please visit www.flickr.com/photos/tarriverlandconservancy. To learn more about volunteering with Tar River Land Conservancy, please contact Sheryl Munt at volunteer@tarriver.org or 919-496-5902.